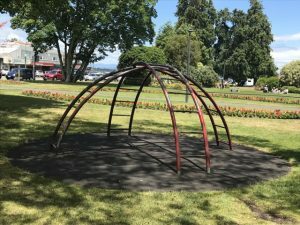 The Domain is home to Taupo’s largest playground with some interesting equipment. There’s a space net with a ‘waggle bridge’, swings and a good selection of equipment suitable for smaller kids like a collection of pods that kids can climb into and then exit via a short slide. There’s also a wheelchair accessible swing. There are plenty of big trees around providing some shade and picnic tables just near the play area. There’s lots of space in the Domain for picnics and walks. Lion’s operate train rides during summer weekends, school and public holidays. The train costs $2. The toilets closest to the playground (‘The Super Loos’) are free for kids but irritatingly, adults need to pay to use them. There are however more toilets closer to the river that are free for everyone! 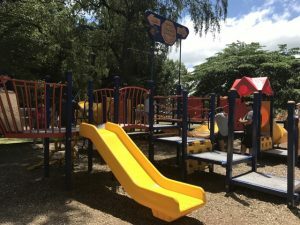 The Domain is completely unfenced from and quite close to the main road, so particular care needs to be taken with kids that are likely to wonder off. Address: Tongariro Street, Taupo. You can park on the main road or on Story Place and around the I-Site Visitor Centre. Check signs for charges.